The Jewish presence and identity in the contemporary world of art is one truly worth noting. At the 3rd annual conference of “Jewish Arts & Identity in the contemporary world” in Baruch college’s Jewish Studies Center, at a panel entitled “Jewish Ways of Seeing: The Visual Arts and the Jewish Tradition”, this Jewish impact on the creative world is exemplified through the discussion of artist Audrey Flack and her various works. Flack was born in 1931 to a fairly orthodox Jewish family in New York City, and was well versed in her Jewish heritage and tradition. Though an observant Jew, one may be confused by Flacks vivid depictions of the Virgin Mary and Jesus Christ as well as other Catholic imagery and symbolism. Among other influences, the artist was deeply concerned with the way women were portrayed, and sought to dispel stereotypes of the excessively emotional woman, restoring strength and empowerment to female depiction. In many of her paintings including Macarena of Miracles, the Virgin Mary is a consistent theme. The infamous heartache and devastation endured by Mary, a Jewish woman herself, over her lost child was a theme which spoke to Flack, which she identified with and which inspired her innovative use of the Catholic religion in Jewish art. It is well emphasized that Flack employs this imagery because of her Jewish religious affiliation, not in spite of it; to celebrate this interrelation and identification with Mary, a Jewish woman and mother who has as well known suffering of the human condition. As pondered by Flack “what is it about Mary that intercedes for all human beings?”. 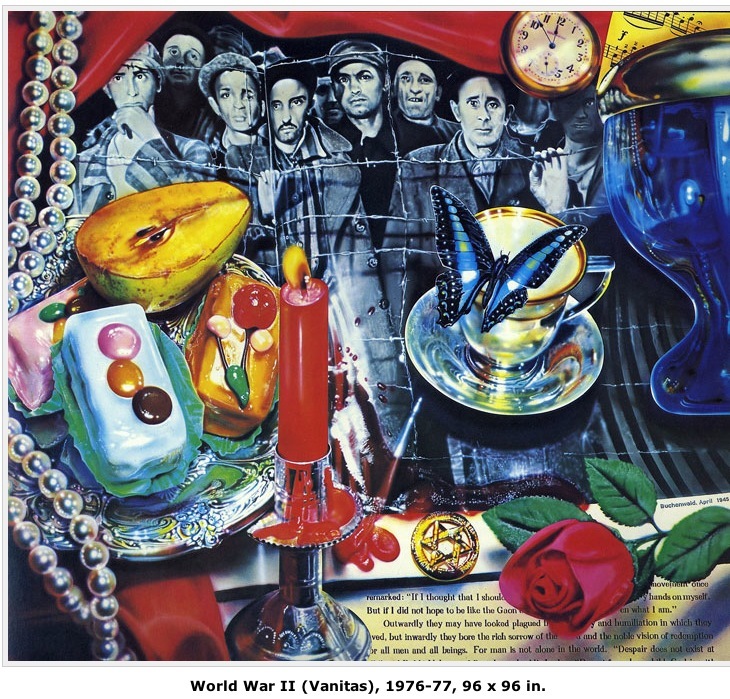 Among other moving works discussed, were her depictions of World War II and prominent figures of that era including Hitler, Marilyn Monroe and JFK. In her painting Marilyn (Vanitas), a young fresher-faced Marilyn is shown, a Marilyn that existed before she reached the height of her fame and tumultuous career. This Marilyn, the artist expressed, evoked her own vulnerability. The use of feminine objects such as pearls and perfume in the painting, give the work a feminine feel, an uncommon motif of photo-realism at that time. On a more somber note, was the discussion of Flack’s riveting World War II depiction. In the work, one can see a black and white photo of prisoners in a concentration camp contrast with beautiful brighter images including a Star of David, a candle, and a silver tray of sweets among other rosy objects. The artist elaborates on this contrast and use of positive imagery to depict a dark time, by explaining that “I chose not to show injury; too much blood has been shed already. I want invite the gaze of the viewer, make them think”. Flack faced much criticism over this painting, this clear, raw depiction of the war many at that time preferred to keep in the past and not “deal with”. Imagery of Rabbi Nachman of Breslov was depicted in the painting as well, used as another contrast to darkness. Rabbi Nachman was best known for his light of heart in the face of tragedy, whom never spoke the word “bad” or knew of its meaning. His presence in the painting represents hope and light, in the face of war, darkness, and despair. Flack has stopped painting temporarily, and is currently working on sculpture art, her most recent project a sculpture of Eve. The work has many powerful feminist connotations and aims to restore the image of Eve and of all women. Eve is depicted as powerful and strong, a woman whom Flack believes we have perhaps been too hard on. After all, “All she did was ask questions”, said the artist. The works of Audrey Flack inspire, teach and inform. They are controversial yet, invite one to search within themselves, to identify with the artists’ careful expression of human emotion and thought.